The top economic policymakers of South Korea and China agreed to boost bilateral tourism and economic cooperation, Seoul's finance ministry said Friday, in a sign that Beijing may stop its retaliation against South Korean companies over the stationing of a US missile system. 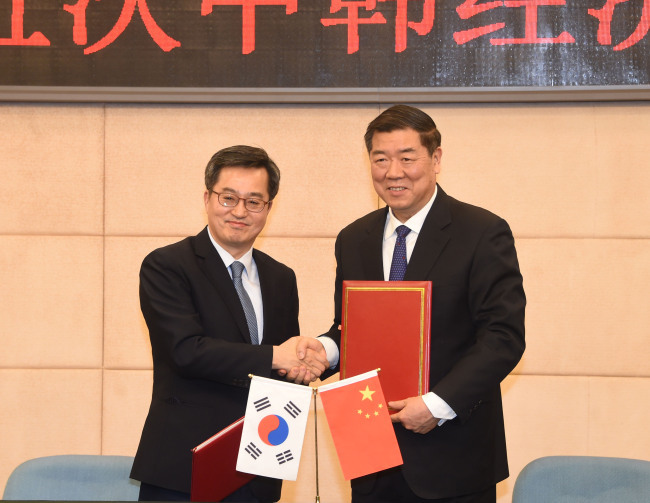 The agreement came after talks between South Korean Finance Minister Kim Dong-yeon and his Chinese counterpart, He Lifeng, chairman of China's National Development and Reform Commission, earlier in the day. Kim has said he will raise the issue of difficulties encountered by South Korean firms doing business in China, who have come under pressure over Beijing's retaliatory actions after the deployment of a missile-defense system, during the talks with He. During the talks, Kim asked the Chinese side to swiftly resolve such difficulties, including Beijing's ban on group tours to South Korea and other measures against South Korean firms, including Lotte and electric battery makers, according to the South Korean finance ministry. Under the agreement, the two nations will establish a consultative body to boost tourism, and set up a pilot free trade zone in China's northeastern provinces. To expand exchanges in the science and technology sectors, the two governments will hold a joint conference, the ministry said. South Korean firms doing businesses with China have felt pressure from Seoul's decision in 2016 to host the Terminal High Altitude Area Defense battery. The system became operational in 2017. Last October, South Korea and China agreed to move past the dispute over the THAAD system, but the dispute is still taking a toll on the business sector. South Korea decided to bring in the THAAD system to better cope with growing North Korean nuclear and missile threats. Arguing that the US missile defense system could also target China, Beijing has taken a variety of retaliatory steps against Seoul, which have strained two-way ties.